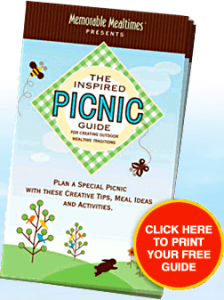 From now through April 30, 2010, when you purchase any Annie’s Homegrown or Annie’s Naturals product, you can get a free downloadable Memorable Mealtimes Picnic Guide filled with recipes, activities, and tips for planning the perfect picnic outing with your family. You’ll also gain access to coupons for all your picnic needs from partners like Earthbound Farms, RW Knudsen, Kinesys Performance Sunscreen, Fresh Picnic, and many more! First, you’ll need to purchase your Annie’s product and then head over here to take a brief survey, enter the product UPC, and get your coupons.